Summons Arvak in the Soul Cairn or Tamriel wilderness to act as your steed. 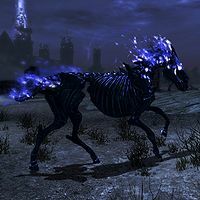 Summon Arvak is an apprentice level conjuration spell added by Dawnguard that summons the undead horse Arvak to ride or to aid you in combat. Arvak can be summoned in places where you cannot bring a standard horse. In addition to the Soul Cairn, as mentioned in the description, you can also summon him in Blackreach, Dayspring Canyon and SolstheimDB. You cannot summon him in the Forgotten Vale, however. Summon Arvak, for 60 secs, if you remain unmounted. Arvak stays summoned if you stay mounted. Sometimes it will seem that when you cast the spell you fail to summon him but it may be that he has spawned on a ledge somewhere above or below you. Get to a place where there are none of these and try again. Summoning Arvak can still be done when you have 100% spell absorption, unlike other summons which would be absorbed. Although Arvak appears to be undead, he is considered by the game to be only an animal and is therefore not affected by undead-related spells. The duration is listed as 60 seconds, but Arvak will actually stick around indefinitely provided you are on his back. Once you dismount, if 60 seconds have passed, he will disappear. One use for this spell is if you are too encumbered to fast travel. So long as you are outside, you can summon Arvak, hop on his back, and then travel anywhere you need to no matter how much you are carrying. Very useful if you're moving all your possessions to a new house, for example. Arvak takes up a summoning slot, so casting a second Conjure spell (or a third with the Twin Souls perk) will make him disappear. Arvak cannot be summoned in the Forgotten Vale although it is a wide open area. Despite Arvak being a unique creature, you can actually summon two Arvaks provided you have the Twin Souls perk. This page was last modified on 17 April 2019, at 11:19.